She calls me "Mama Leisha": Shut It Down! Sorry for the typos. My phone has definite ideas of what it wants me to say... I hope you got the gist of it all. I loved this post so much. I love it when something speaks louder than my own crazy thoughts! Thank you!!! Love you and all your great wisdom sweet friend!! You are a good mom and a wonderful example. You share bed head pictures and tell it like it is...poopy and all. And I agree, never before have we as a human race been able to share our lives so easily and openly (some wayyyy too much)...but what people need to be reminded is that most people share the HIGHLIGHTS. I get told at chuech I live such an exciting life and I laugh and tell them they only get the highlights...who wants to see my rather boring life!! 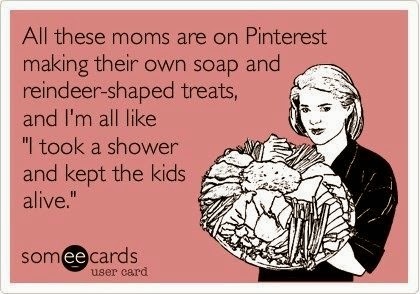 Laundry is real, dirty houses and messes are two but they ain't pinterest worthy! So I will try my best to shut it down!!!!! I'm trying to get better at shutting it down more often. It's not easy but it gets easier. And posts like this are the perfect reminder.